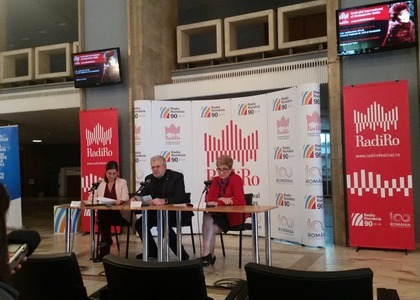 Today, November 15th, there was a press conference for the fourth edition of the International Radio Orchestra Festival - RadiRo, organized by Radio Romania between the 18th and 25th of November took place. Starting this Sunday, attendants will be able to enjoy eight symphonic concerts and four jazz concerts, a premiere series for the festival programme, at Sala Radio and the Auditorium of the National Museum of Art of Romania. 2018's edition of "RadiRo" brings prestigious European orchestras belonging to some of the most important public radio stations to Sala Radio. The BBC Philharmonic Orchestra, the MDR Leipzig Radio Symphony Orchestra as well as the event host, the National Radio Romania Orchestra, are just a few of the performing orchestras. The jazz concert series will feature big bands of public radio stations from Denmark, Croatia and of course, Romania. Aura Urziceanu will return to Romania for the first time in several years, to perform for the "RadiRo" festival audience, along with Radio Romania's Big Band. Among the guests performing at the "RadiRo" festival are first tier world-renowned musicians: conductors Vladimir Ashkenazy, Nathalie Stutzmann, pianists Mihai Ritivoiu and David Fray and violin player Andrei Ioniță. "This is our fourth edition and not only have we grown in participation, but the new jazz section shows that we can and already have succeeded here, in Bucharest. It's a source of pride for us, to be able to bring a great classical music event to Bucharest, together with our partners at Artexim." "I hope to see all of you in the concert hall this week. I must mention the two young Romanian musicians who will be joining us as guests, namely pianist Mihai Ritivoiu - the soloist for the MDR Orchestra of Leipzig - and well-known violin player Andrei Ioniță. Aside from Aura Urziceanu, I believe this is the first sold-out symphonic concert we have had this festival. All of the festival's concerts will be broadcast live." Also present at the event was Mihai Constantinescu - director of Artexim, which is organizing the event jointly with Radio Romania. The first concert in the RadiRo festival will take place on Sunday, 18th of November, featuring the Radio National Orchestra. Together with conductor Jean-Claude Casadesus and pianist Javier Perianes - soloist, the programme will also include opuses by George Enescu, Claude Debussy and Maurice Ravel. The concert will be broadcast live on Radio Romania Muzical, starting at 19:00.